I cycled through many cities. Each time I moved into a new place, a bicycle was one of my first purchases. Not because I am an overly passionate cyclist or extremely sporty but the bike was usually one of the cheapest, most convenient means to get around (and environmentally friendly at the same time). I cycled through Stuttgart, Berlin, Hamburg, Uppsala, Linköping, Copenhagen, Wellington – no matter if the city was crazy hilly, covered in snow, or hit by heavy downpour, hail and wind. I was never inclined to stop – until I moved back to Wellington this summer. After having spent the last eight months in Copenhagen, a city which is famous for its biking culture, it was hard to get used to Wellington’s biking conditions again. But, like I said, my frustration is not triggered by the city’s climate or its geography – it is rather a matter of not wanting do die on a bicycle. Wellington has barely any bike lanes. There isn’t enough space neither on the sidewalk nor on the road. And, whichever way you chose, you constantly have to face some obstacles. Broken glass and metal on the sidewalk, unexpected bumps and holes in the street surface – not to mention cars, buses, trucks and motorbikes. Today is the official opening of Wellington’s Pukeahu National War Memorial Park, a multi-million dollar project which involved serious redevelopment of the area, including a new traffic underpass for State Highway One. According to Wellington’s city council, the project will improve the setting around the war memorial, provide “public space for everyone to enjoy as well as good walking and cycling connections.” Yet again, there is no visible cycle lane but a very obvious road for cars to cross the park. The remaining space (shared by pedestrians and cyclist) is a mixture of cobblestone pavement and asphalt with some sort of rainwater drainage channel running through – not a very smooth ride. The only real sign that this space is for cyclists as well is the little ‘bicycle’ signal that pops up when pressing the button for the traffic lights. So, biking through Memorial Park is pretty much like biking anywhere else. Average road conditions, limited space where either pedestrians or car-drivers are in the way, looking annoyed, irritated or just completely oblivious. These seem to be the usual reactions in Wellington’s traffic, reinforcing and being reinforced by a mutual disrespect between all the road users. So, mandatory helmets for cyclists seems to be a reasonable safety measure, yet, I’m wondering, if the government would actually be concerned about the safety of cyclists, why don’t they just build proper bike lanes through the city instead? Infrastructure works the same for cars and for bikes: if you build it, they will come. 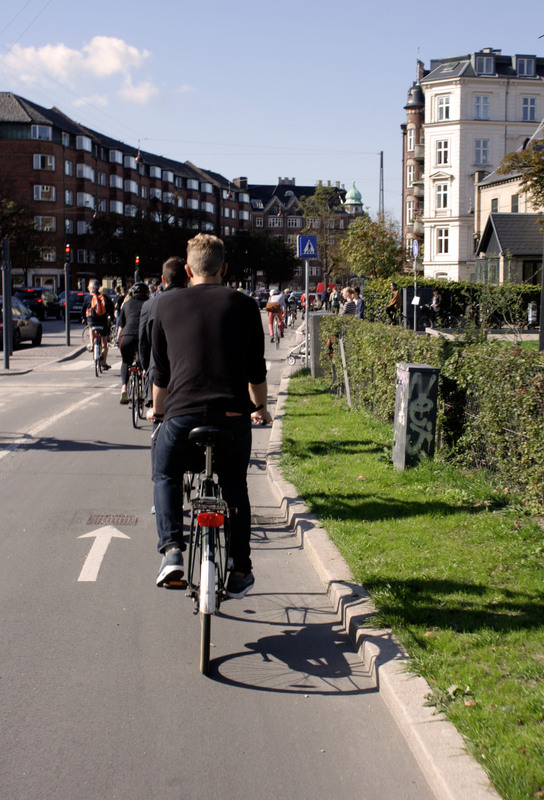 Copenhagen has approximately 350 kilometres of curb segregated cycle tracks, 23 kilometres of on-street cycle lanes and 43 kilometres of off-street green bicycle routes running through parks and other green areas. According to their current ‘bicycle strategy 2011-2025’ they are still expanding the network considerably. Of course, an advanced bicycle infrastructure like that comes with a well developed set of written and unwritten rules for cyclists. Being new in the city and unaware of those particular rules and rhythms, might make the first biking experience(s) feel rather intimidating as you get irritated looks or hooted at by your fellow cyclists as soon as you violate their bicycle etiquette. In Copenhagen cyclists bike mostly in a brisk pace without much leeway, yet the movement seems carefully orchestrated, creating what David Seamon (1980) calls ‘place ballets’. Place ballets describe the regularities or rhythms of a certain place – it’s fluid environmental dynamics and collective choreographies of interaction and congregation that constitute everyday spaces and places. They can occur inside or outside, in streets, public spaces or neighbourhoods. Looking at those place specific rhythms – the ways people navigate through the city (by bike, car, public transport or walking) and the way they attune themselves to the city’s specific urban rhythms is part of ‘sensing out’ a specific place. If a city feels social and intimate or distant and cold, relaxed and easy or speedy and stressed, depends on the intensity and dominance of certain kind of rhythms (Wunderlich 2008). A city’s ‘pace ballets’ have therefore an effect on how one understands, perceives and feels about that urban space – which in turn affects the way one designs and performs their everyday social life. 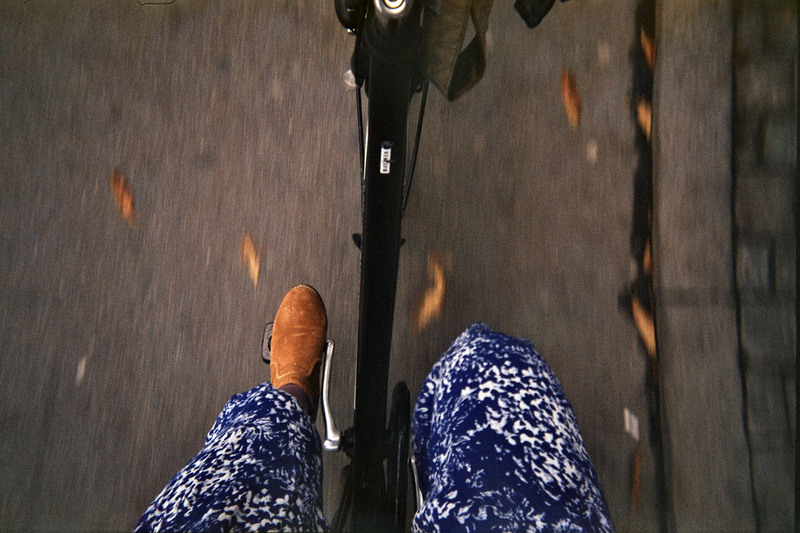 Biking in Copenhagen and Wellington is therefore not only about ‘getting around’. It is about individuality and sociality, about power and politics, about norms, habits and conventions, communication and synchronisation, feelings, emotions and most importantly about the well-being of a city’s inhabitants. Seamon, D. (1980). Body-subject, time-space routines, and place ballets. In Buttimer, A. & Seamon, D. (eds.) The Human Experience of Space and Place, pp 148–165. New York: St. Martin’s Press. Tags: cycling Copenhagen, cycling Wellington, urban rhythms. Bookmark the permalink.